Green Card Fund was in need of a revamp regarding their web presence, they knew who to call for a corporate web design. 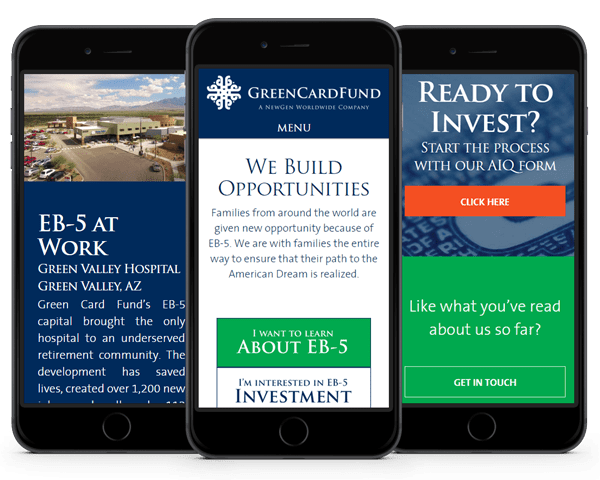 Green Card Fund is an investment summit in Arizona that focuses on certain projects designed to improve healthcare, hospitality, education, and municipal infrastructure as well as transpire green technologies. They have been a client of ours for over 3 years now and we have been itching to re-do their website since we first met. In 2015, we were able to take on this task and provide Green Card Fund with a completely new and up-to-date website! Our main focus was to immediately show all of what Green Card Fund executes and has to provide. We wanted to display the important facts as the first thing a viewer on the main page would see and then connect with emotionally. Built with a brand new WYSIWYG editor within WordPress, the site is incredibly fast to update and add new pages whenever they may be needed. It also came in handy when the time came to translate the entire site manually to Chinese! Normally we would use Google or another automated Translate feature, but Green Card Fund needed expert, professional and precise translation work for their overseas audience. The mobile look and functionality was the most important to our client, as much of their audience was expected to view the site from their mobile devices. We were able to secure a site that was easily accessible and extremely user friendly. On top of that, when navigating from a mobile phone, the entire site is extremely easy to understand and use. Luckily, the platform we built the site on has ease-of-use in removing unwanted and bog-down features such as sliders and video backgrounds that cause higher load times. Green Card Fund now has a fully functional, responsive, easy-to-use and modernized site that allows quick and efficient changes as well as maintaining the physical attractiveness factor. We designed a custom and brand-consistent website that they can continue to set the bar high and meet their expectations but most importantly, continue to impress and satisfy any potential customers.